• Soybean and wheat seed production. 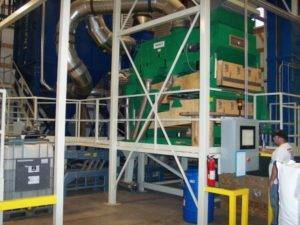 • New in 2009 soybean, wheat seed conditioning facility. • Annual capacity: 1,000,000 units. • Over 100,000 sq. ft. warehouse space. 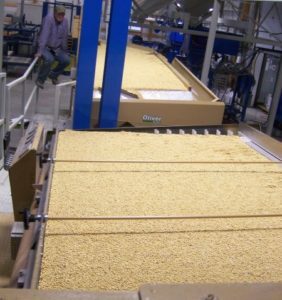 • Computerized grain storage management system. • Mineral oil dust suppression. 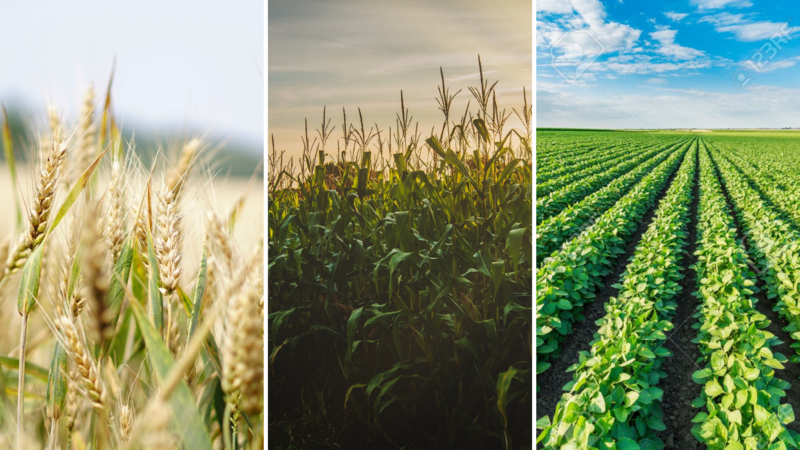 In 2009, the USDA projects that Missouri’s harvested soybean acres will rank fifth in the nation. Much of that crop is produced in Missouri’s boot-heel region along the Mississippi River. Another pocket of concentrated soybean production is located in Saline, Carroll, Chariton, and Lafayette counties about 75 miles east of Kansas City, MO. 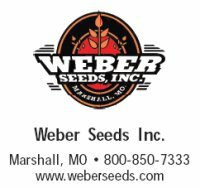 Here in central Saline County is where Weber Seeds is located. 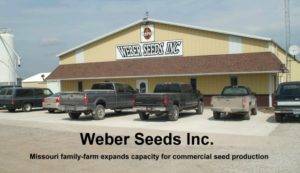 For nearly 50 years, the Weber family’s diversified 10,000 acre farm has been producing certified soybean seed along with commercial corn and wheat. Bucket elevators…….. Universal Industries Inc. Gravity separator …………. Oliver Mfg. Inline storage .. Popp Engineering Inc. Valve gates ……Popp Engineering Inc.
Vibratory conveyor ….. Forsbergs Inc.
(top) Westrup airscreen. The dust suppression oil tank is in lower-left corner. 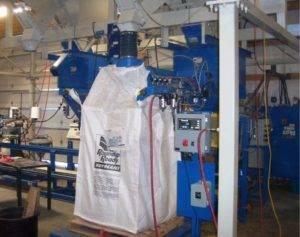 (above) Oliver gravity separators operating wihout dust hoods. Plant Manager E.W. Browning at the Gustafson seed treater control panel. Filling spout-top bulk bag. Single-unit heat seal closer and bag stitcher in the background. treatments. With too little oil, the treatment becomes ineffective. 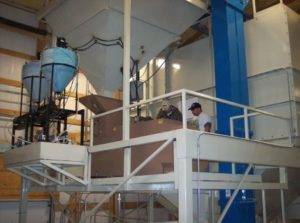 The secret is to get the seed as clean as possible before adding oil.” In addition to calibration, Popp Engineering also devised a seed sensor to coordinate oil application with the presence or absence of seed on the conveyor. The effectiveness of oil suppression is evidenced by the lack of hoods on the Oliver gravity separators. Normally, large hoods and high volumes of air are required to contain the dust from these machines. 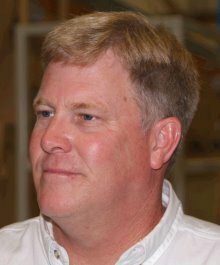 Popp calculates that the elimination of hoods over the gravity separators reduces the size of the dust collection system by 68 percent.